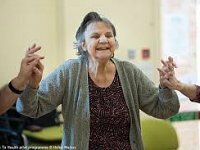 'Second Wave' of Dance To Health Sessions. Take steps to stay as fit as possible in more free dancing sessions taking place at Firvale Community Hub on Wednesdays from 1.15-3.15 and Balfour House, Stocksbridge on Thursdays from 1.30-3.30pm plus female-only sessions on Mondays from 1.30-3.3opm at the U-Mix Centre, Asline Road, Lowfield. Get Dancing! !